Since moving to LA, I've started going to the Venice Beach Gold's Gym. This is THE original Gold's Gym, the one that was featuring in the movie "Pumping Iron" and Arnold Schwarzenegger went to! Next to Muscle Beach, the men and women there are just crazy - perfectly tan and toned. The women especially can be intimidating, with a mix of female body builders and makeup wearing wanna be actresses. I know I'm not out of shape and have been called a gym rat more than once in my life... but it's still a little disheartening to hit the gym lately! The cure? New workout clothes of course! I'm not sure how I came across this athletic wear store, Carbon38, Facebook ad maybe? But I am totally in love with their super cute printed leggings and cool girl tops and I must have it all! Prices could be a bit better though... sigh. I haven't blogged in MONTHS so you know it takes something very special to get me to post! 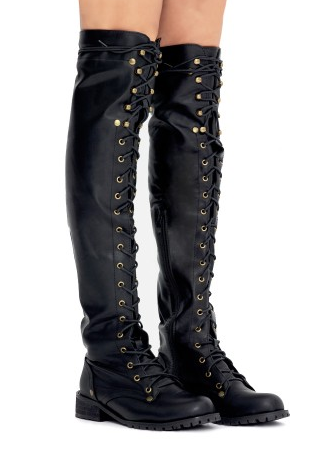 These lace up over the knee boots totally fit the bill. Not only are they perfect for fall, they're a totally reasonable $89 at Pixie Market! You know they will sell out so allow yourself this impulse buy today.